If the thought of walking into your boss’s office to negotiate a raise, a promotion or even a vacation makes you a little uncomfortable, you are not alone. Few people enjoy campaigning on their own behalf, and it can be an especially difficult process for women who are anxious about coming across as pushy or unlikable. Now just imagine having that same conversation, only instead of in an office, it’s happening on a stage in front of a packed ballroom as a giant clock counts down. Well, that is essentially the challenge three women faced on Monday afternoon as part of Mika Brzezinski’s Grow Your Value bonus competition, a contest that awards $5,000 to the woman who can best articulate her value in a 60-second pitch to the Morning Joe co-host. Though substantial, the bonus wasn’t the biggest prize of the event in New York City. The real takeaway, rather, was this vital lesson for any woman in the workforce: With the right mix of mentoring, messaging and, yes, styling, presenting your strengths clearly and concisely doesn’t have to be so scary after all. In fact, it can be an essential tool for knowing – and growing – your value. Monday’s winner was Tiffany Hamilton, 37, a higher education administrator, coach and motivational speaker who last month moved from Kansas City, Missouri, to Stamford, Connecticut, after her husband got a new job. “I left a 14-year career to support my husband in his career,” said Hamilton. She added that her husband wouldn’t have hesitated to do the same for her were the situation reversed. Competing alongside Hamilton on Monday were two other finalists: Barbara Ginty, CEO of Planancial, a one-stop-shop for online personal finance classes, and Jen Scherer, Chief Event Officer of Magnified Events, which provides customized team building experiences for companies. All three finalists created 60-second video describing why they deserved a $5,000 bonus. They were selected from over 100 submissions. She recorded her video selfie-style while out jogging one day. “I was a sweaty mess!” she joked. Ginty, on the other hand, was initially only planning on coming to Monday’s Know Your Value event as a guest. It wasn’t until after she bought a ticket that her friend encouraged her to submit a video for the Grow Your Value bonus competition, too. I feel like we’ve already won just by being here. It really has been amazing. Over the course of two weeks, the finalists worked with Glynis Karp, senior vice president of merchandising at J. McLaughlin, to find unique styles that made them feel both comfortable and confident. They also worked with personal leadership coach Liz Bentley, who helped each woman hone in on her strengths and craft a perfectly tailored pitch explaining why she deserved the bonus. For Bentley, a major point she often tries to stress with clients is that fixating on weaknesses can fast become one of the biggest barriers to success. By Monday, the three finalists were as prepared as could be, but the whole competition still boiled down to their one-minute pitch. 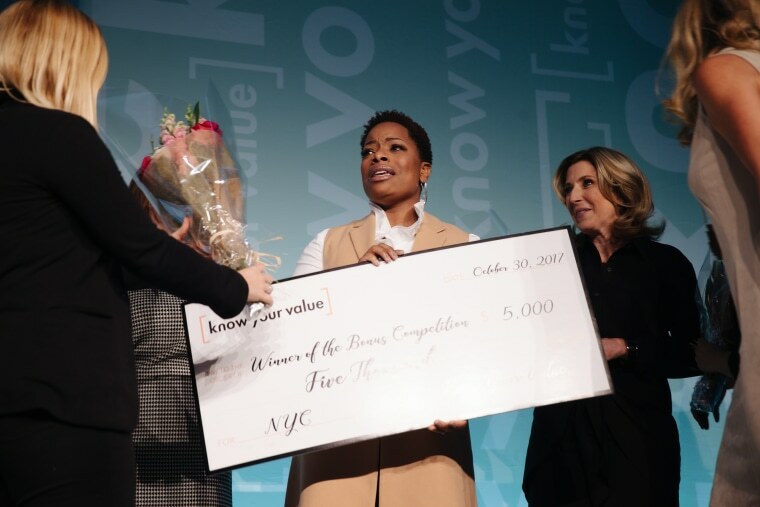 Judged by a panel consisting of InStyle Editor-in-Chief Laura Brown, MSNBC’s Willie Geist, and NBC New York’s Sara Gore, each woman delivered an impressive performance. But ultimately, it was Hamilton’s heartfelt speech about becoming a mom at 15 and surviving an abusive relationship that left the room full of hope (and more than a few tears!). InStyle’s Brown was hooked. “I want to walk audaciously in your awesomeness!” she exclaimed. And even though only one person walked away with the big bonus, no one left empty handed. Take it from Jennifer Hotchkiss, 39, who competed in the very first Grow Your Value Bonus Competition three years ago in Hartford, Connecticut. She didn’t win, but her pitch did land her a scholarship at Bay Path University, where, after just two years, she was selected to be the school’s commencement speaker. Ginty and Scherer, the other two finalists in Monday’s competition, spoke to a similar feeling: Not only did they learn about themselves and why they have value, but they picked up new friends and cheerleaders in the process. They even have a special group text.